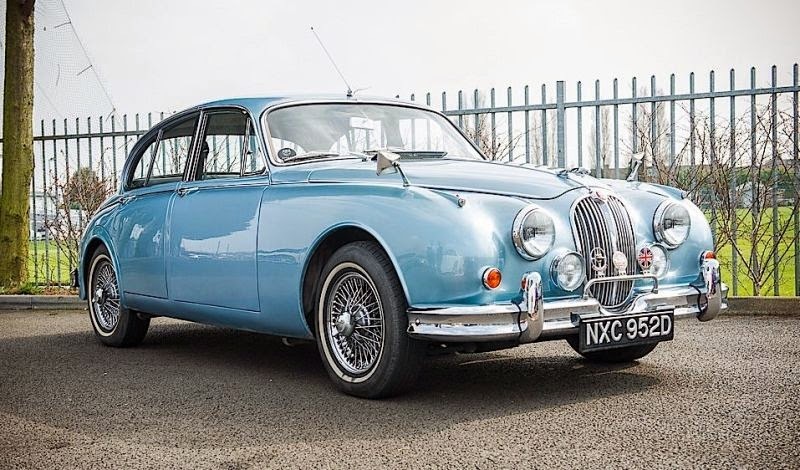 An old Jaguar cars, Jaguar Mark 2, will be auctioned at the event Classic Car Auctions (CCA) in the UK. Display cars made in 1966, it was almost like the original because all components of the car, from the outside to the inside, still using materials such as when exiting the factory. As quoted from autoevolution, Sunday (04/12/2015), the vehicle odometer shows 61 214 kilometers. A sign of the owner when it was only used at certain times only. Whitewash body parts in blue, beautify the appearance plus some British flags and placards jaguar logo on the front end. Chrome accents are used on the front and rear bumpers, grille, light frames, and mirrors, thus reinforce the impression of the car's retro. Inside the cabin is dominated by wood accents on the dashboard and steering wheel. Front and rear seat covered with black leather. In addition, the indicators still retain the original design manufacturer. Power source using a six-cylinder engine with a capacity of 3800 cc. This machine is capable of spraying power to 220 HP. Jaguar Mark 2, capable of accelerating from 0-100 kilometers per hour speed in 8.5 seconds. Old car of designer Sir William Lyons will be offered at prices starting USD36.500 . No Comment "Still Original, Jaguar Mark 2 Production 1966 Auctioned"